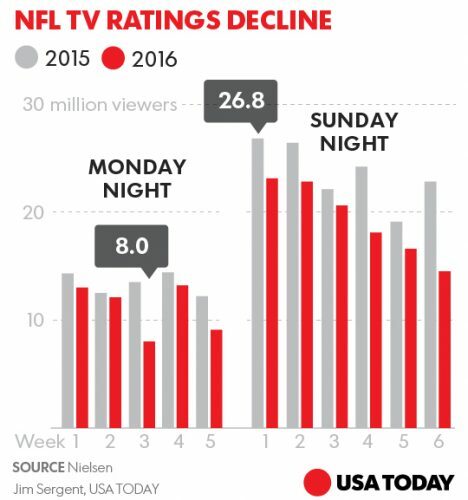 Sagging NFL TV ratings leave owners scrambling for answers. “It’s an election year, silly. That wasn’t the entire company line, but the impact of the dramatic presidential election cycle was certainly a prevailing sentiment as NFL owners gathered Tuesday for their quarterly meeting and assessed the league’s unusual and precipitous dip in TV ratings. Perhaps, it could have something to do with the number of NFL players kneeling during the national anthem? Maybe Americans just want to take a break from all the politics to watch some good old American football instead of spoiled (oops, I mean “oppressed”) athletes engaging in political protests? Stop Hillary PAC Launches Benghazi-Themed Ad in Swing States.